Bending The Arc Of Human Potential – YOU CANT STOP THE SHOW!! 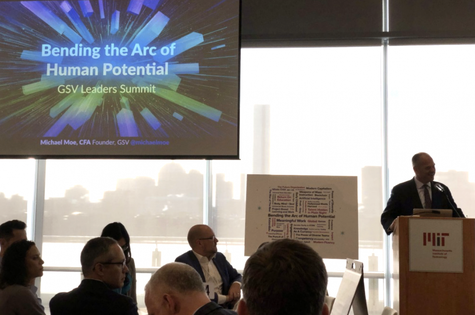 Michael Moe, Co-Founder + Partner at GSV Asset Management kicks off GSV Leadership Summit at MITTom Vander Ark “Talent is equally distributed but opportunity is not,” said Michael Moe (above) in his kickoff address to the GSV Leadership Summit at MIT. “Talent is equally distributed but opportunity is not,” said Michael Moe (above) in his kickoff address to the GSV Leadership Summit at MIT. GSV is a new economy venture fund, accelerator and convenor. Over the last 10 years, the ASU-GSV Summit has become the most important meeting focused on innovations in learning. They hold several smaller meetings during the year, like the one in Cambridge last week, for edtech CEOs and investors. The summit kicked off with a design thinking exercise on strategies for bending the arc of human potential. During the workshop, participants including Hanna Skandera (below), former chief in New Mexico, developed plans for new tools and practices that would spread access and build employability skills. 1.Robots Teach Coding. Vikas Gupta started the development center in India for Amazon. He left in 2006 to launch Jambool, an online virtual goods monetization platform. After selling the company to Google, Gupta launched Wonder Workshop, maker of Dash and Dot, the robots that teach kids how to code (see feature). 2.Digital Assistants Teach Math. Ian Freed led the Amazon team that developed Alexa. Excited about the learning potential of digital assistants, Freed left a year and a half ago to launch Bamboo Learning with a mission to teach using voice-based devices. Bamboo offers music and math. Skills get more challenging as students master different levels and Bamboo tracks progress and awards badges. If parents opt in, they can receive results via email. Amazon alumni Freed and Gupta were inspired by the kind of learning they wanted to see for their own children and used their technology and organizational development skills to make it happen. 3.Education as a Benefit. Rachel Romer Carlson, CEO of Guild Education (who trademarked “Education as a benefit”) sees automation quickly changing the employment landscape. Large employers are scrambling to upskill workers likely to be displaced. Guild provides education programs as a benefit for employees of Lyft, Walmart, Taco Bell, Discover, and Chipotle (see feature). 4.Insourcing Top Talent. After years of duty at Goldman Sachs and Bain, Rob Biederman co-founded Catalant Technologies to help companies locate and contract with top talent for specific needs. The expert marketplace helps companies build an agile workforce. Companies rate and review the employees and provide relevant and contextual feedback. Top earners make $800k or more. 5.Equality for Women at Work. After eight years on Wall Street, Stanford Law graduate Georgene Huang knows It’s not always easy being a woman in the workplace. She founded FairyGodBoss to help women advance at work. They offer company ratings and job listings, as well as discussion boards and career advice on pay, culture, benefits, and work flexibility. YouthForce NOLA, and a student voice initiative from Kentucky’s Pritchard Committee. 7.College for Refugees. Online learning leader Southern New Hampshire University (SNHU) created Global Education Movement (@snhu_gem) to bring college degree opportunities to refugees around the world. Launched two years ago, GEM is the first large scale initiative to bring American accredited university degrees to the most marginalized population in the world with a goal of educating 50,000 refugees in 20 locations by 2022. Early results in Rwanda are encouraging with high completion and employment rates. SNHU is also extending learning experiences to urban youth in America through a recent merger with LRNG (see feature). Former Education Secretary Arne Duncan said that in this market everyone needs to be a lifelong learner displaying curiosity and creativity. In places like Chicago, said Duncan, access to quality education is a matter of life and death. Each in their own way, these seven organizations are bending the arc of history toward expanded human potential. This post includes mentions LRNG, a Getting Smart partner. For a full list of partners, affiliate organizations and all other disclosures please see our Partner page. Are You Trusting Employees Or Just &#039;Empowering&#039; Them?